I was born in South Wales, near the coast which I still love, and trained at Barry Teacher-training College, followed by a year at Cardiff School of Art, where I experimented with embroidery under the tutelage of Esther Grainger. 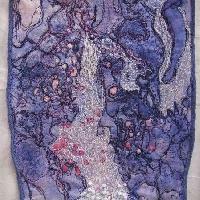 I taught Art Design and Crafts at 2 schools in Derbyshire, and I then started to develop my ownwork with dyes and stitching, exhibiting at the Sheffield Crucible theatre and a gallery in Northampton. I also attended various large craft shows, demonstrating and selling my work, attending several courses in different media over the years. These included working with Michael Brennand-Wood, Jenny Cowern, Caroline Broadhead and other experienced practitioners, and developed further my love of colour, texture, and the freeing of inhibitions where media are concerned. Since moving back to Wales, I work in a more abstract way, focussing on the colour, shape, patterns and textures that have caught my imagination, which are quite often from nature. I also use paint, make hats, and use semi-precious stones in jewellery. I also made the costumes for the BAFTA - nominated animated film ' LOUNGE ACT' written and directed by my son Gareth Love. I love working in layers,cutting into them after stitching, so the composition changes as each layer is revealed. Another technique I use is 'darning' across threads to make braids, and then 'darning' the braids to make fabric, sometimes made into individual hats. Since moving to Wales, I have exhibited at the Cube, The Walls Restaurant, Oswestry Library, Newtown Gallery, The Willow Gallery in Oswestry,The Gateway Gallery in Shrewsbury, and at my home as part of the Open Studios.